Pool Junque or Pool Junk? I sometimes acquire pool junque. 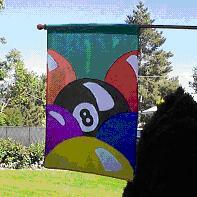 Now pool junque may be cheap or expensive, an antique or junk, or may just be any interesting old thing that is remotely related to cue sports. 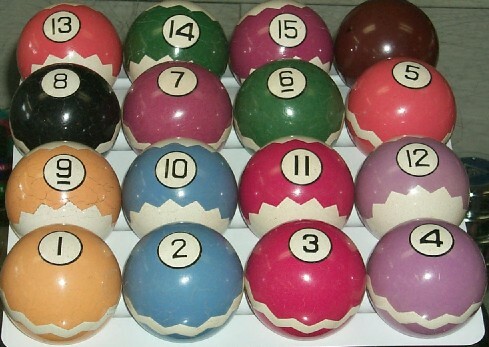 How about this set of Zig-Zag pool balls? Brunswick, in a silly attempt to do something different, made the strips a Zig-Zag pattern. They were not popular with players, probably because pool players watch the spins on the balls as they fly about the table and instinctively try and predict what insanity is about to happen. The Zig-Zag balls probably supplied too much visual information and was deceptive. 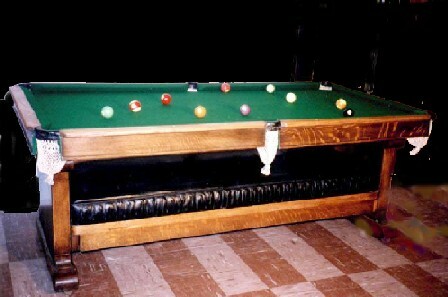 A few drunk players blowing chow onto the table or at least getting nauseous sealed the Zig-Zags fate as pool memorabilia a.k.a. pool junque. I wonder if the Zig-Zag balls would be appropriate for this Zig-Zag table? I have played on one of them. Table runs are interesting, to say the least, but safeties are a snap when down to one or two balls. The best I can figure is someone had two damaged tables, some tools, and a quart of whiskey and used them all at the same time. I have some old cues, old balls (no comment) and old books besides other gizmos. Not much stuff, nobody is going to amass my junque and open a Carlo Billiard Museum after I’m gone, but just some fun stuff. Then there is Pool Junk. You know, the worthless stuff that is manufactured, written, devised, engineered, envisioned, dreamed or otherwise leaps into existence because of some entrepreneur’s desire for your money. Stuff like the CD that you play that will sub-consciously make you shoot straighter. It must whisper "Stay dowwwwwn. Chalk your cuuuuuue. Smoooooth strooooooooke." Beats me, that's for sure. Some of the stuff masquerades as training materials, with a very mixed value of true benefit to your game. An example comes to mind of a product championed by a truly world class player. It involves a tube through which you run your cue stick back and forth. It gives you a good stroke. Uh Huh. If you touch the side of the thing you did it wrong. If you don’t touch the side of the thing you now have a world class stroke. This how to beat top players like the "rifleguy" character that peddles it. I suppose 10 minutes now and then might help somebody with a relatively clueless concept of stroke but a toilet paper tube taped to a something would have the same effect, good, bad or nada. It’s not like you are going to put in 4 hours a week stroking through the tube at a pool hall and might wear it out. If you do use a stroke-tube for hours-on-end you obviously have a high degree of commitment to the game but will still fail because you are a complete moron. Chalk holders are another source of infinite gizmo-ism entrepreneurs. Plastic, magnetic, engraved, strings, spring loaded take-up reels, stick/string combinations and on and on. Personal preference here, I just shove it in my pocket, green pockets be damned. My favorite Pool Junk – Chalk holder division – is this creation that somebody with a barrel of dead alligator heads decided was a good use for those dead alligator puppy heads. $29.95 plus tax, S&H. Yup, that’s a chalk holder in its mouth and a splash of epoxy holding it together. I can’t wait to see the look of envy when I pull that one out in at Texas Express Tour Stop or at a WPBA event to put my love moves on Jeannette Lee. THAT will certainly impress her and make her want to prance, dance and go skinny-dipping with me. I hope she’s not camera shy, I’ll want proof to show my buddies. The old stand-by of stand-by’s are the prints of dogs shooting pool. 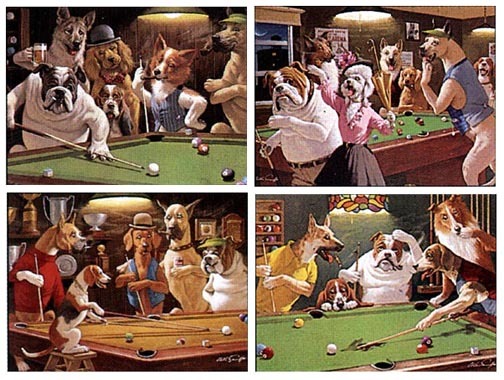 One of my buddies has a complete set of these prints in his house, right along side the pool table in middle of his living room. It looks great and fits his decor motif, par excellence. You get one guess if he is married or a bachelor. Buzz, times up. Some of the items are reasonable, and just a variation of style, as in the chalk holders, well, at least most of them. Some are invented by psychopaths who have never played the game but are convinced they have the solution, and others are just cottage industries where somebody needs to make a buck with leftover PVC and feathers and thinks pool players are goofy. Ok, ok, they ARE goofy so maybe they have a point. Now this one is cute. I guess you could hang out this flag when your billiard room was open for business and the coast was clear for your neighbors to flock over for a brew and a break. This should be a big seller. 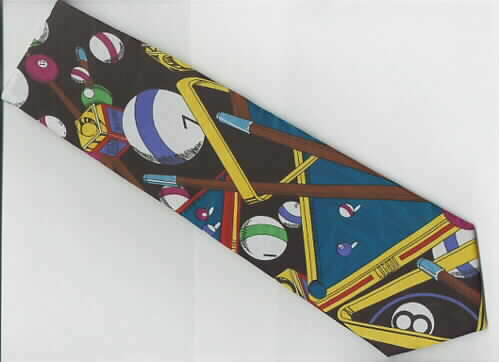 Ties, suspenders, shirts, jackets are fun, with some making significantly different fashion statements than others. Posters of cartoon rabbits and ducks playing pool would look right at home in YOUR house, just not mine. 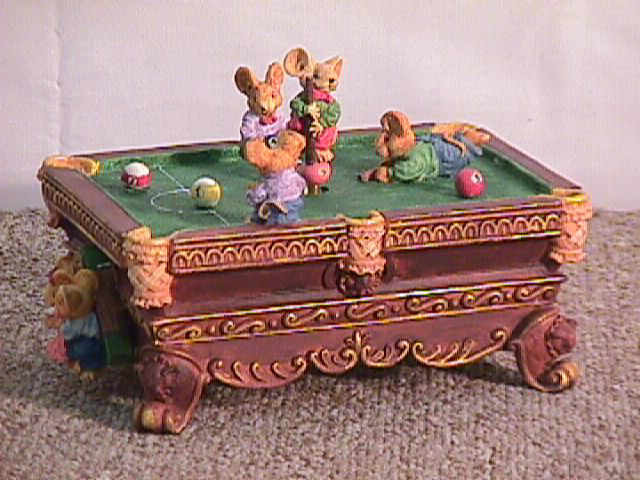 I saw a teeny-tiny pool table with varnished ex-frogs standing around playing pool. I guess that fellow had dead frogs out his wazoo and this was the best use for them he could muster. I would have bought them if they wiggled and sang an Elvis tune but maybe in his next model he’ll include these important technological advancements. He must have gotten his idea from this old Brunswick ad. This little gem is a porcelain box where you could keep chalk or quarters, I guess. It was well done but I was a little short of the $100 the guy wanted for it. I’m sure it took a bunch of effort to make it but I had other budgetary constraints. Like food and electricity and beer. You can park it against a wall or in a corner and when you shoot, you just turn the table top so the cue ball comes around to you instead of you walking around to the cue ball. The playing surface is a hexagon, but the circular portion rotates. I guess you have to do it slowly or this would be a great time to pot the cliff-hangers. I’m going to wait for the motorized version before I send in my credit card numbers. 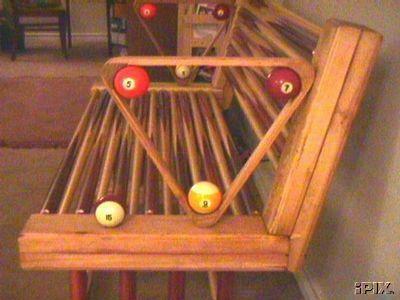 There must be a hundred different kinds of cue holders for when you want to park your cue. Things you can set at the edge of a table. I bought a 2-bagger (for my breaker and shooter) at the BCA Nationals one year. I started to use it but every time I came back from shooting the parking spot was filled by some teammate who must have expected me to never actually put the cue back down. I swapped it in for a 4-bagger, and then a 6-bagger and finally assured myself of at least 2 parking slots when I started to sell any non-Carlo cues that landed in my parking lot. The assortment of cases is overwhelming and which to use is your personal preference. 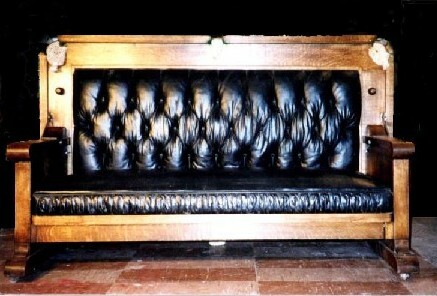 Luggage type, tube type, common or custom, leather, wood, aluminum, it’s your call. I had a particularly profitable run on the table one evening a few years ago. I popped for a custom leather jobber about the size of a small golf bag. It was either that, or go ahead and lose it to the next guy, so I’m glad I still have something left from the far-too-infrequent moments of shooting god-like. 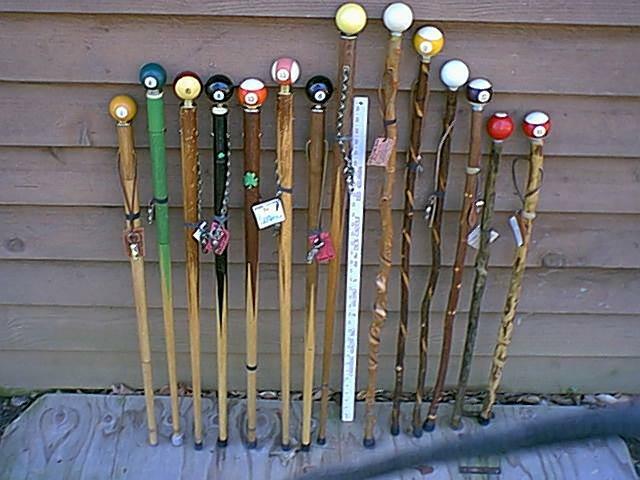 I have a few pool-cue convertible canes. This pool-trash that was sold to sailors on shore leave in the orient so they could have their own cane that, ouila', turned into a pool cue so they would be ever-ready for a big game and, as a bonus, had a club for battling their way out of tough bars. Unfortunately, the first time they either hit a ball or hit a head the dang thing would come splintering apart and they’d be left standing there with a cube of chalk as their only defense. I love’em but they are useless for pool. A certain tobacco company has unleashed on the pool world a steady stream of ships-of-the-desert pool stuff including ashtrays, posters, cues, lighters, underwear, luggage, pool balls, jackets t-shirts, and condoms but I can’t badmouth their efforts as long as they keep up their interest in the pool world and shove advertising dollars in our general direction. The beer boys have pool cues for every flavor of beer, as do the professional football teams, although I haven’t seen any from baseball, hockey, or basketball. I think a Michael Jordan jump stick would be a natural. I think I’ll get his endorsement and put it up against the Frog jumper. Here is another in the “Cute animals that play pool” series of pool junque. It looks as if it is well done, but then again, 4 dogs playing pool on black velvet, as artistically skilled as its creator MAY be, still does not have a place on my wall reserved for its future acquisition. Pool playing mice. Based on their size, I imagine that they are about to perform the equivalent of you or I whacking at an oversized bowling ball with a Bic pen. I don’t care how fast they move their cue, the cue ball is not in any danger of wreaking havoc or going airborne. 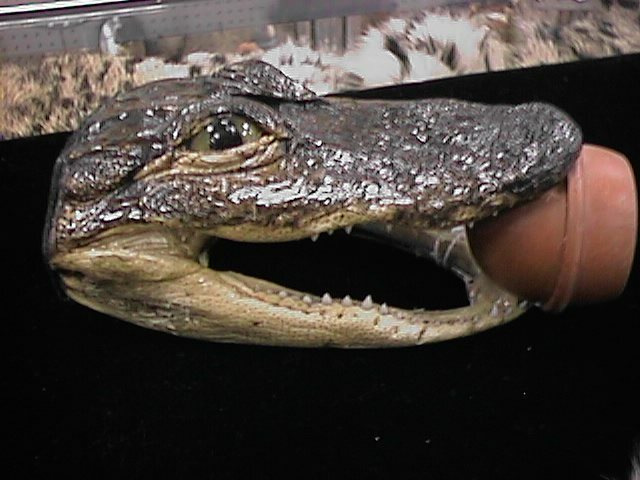 I’m holding out for a Christmas nativity scene of mice, frogs, dogs and alligators playing pool on a Zig-Zag rotating table while sliding their dohickeys in and out of plastic tubes, leaning on cue-canes with Joe Camel T-shirts, lighters and ashtrays and all are wiggling to an Elvis tune. “Don’t be cruel” comes to mind. Now THAT would be cool! Yeah, Right. Nobody paid me any money to put these links here, I just thought they deserved it. Tell them Carlo sent you, maybe they'll buy me a beer.